A mechanical protractor is a simple tool used to draw and measure angles. They are familiar to most Americans from their elementary or middle school years, as they have been used to teach mathematics, especially geometry, since the turn of the 20th century. Although used by every student, most people never use them again. However, they have a lengthy history of application in a variety of fields. The protractor has been around for over 500 years. The inventor of the protractor is thought to be Thomas Blundeville because he described a tool for measuring and drawing angles in a 1589 book on map making. By the early 17th century, navigators at sea and surveyors on land were using protractors. Because of the many uses, manufactures have designed protractors in many shapes and sizes. Along with the common semicircle used in schools, they have been made in circles, quarter-circles, and rectangles. They range in size from as small as two inches in diameter to in excess of one foot. Protractors have been constructed of wood, steel, and brass, as well as the plastic type used in schools. The semicircular protractor with which most people are familiar, measures angles in degrees, as in 45° or 63°. It is usually divided into 180 equal parts. In addition to measuring angles, protractors are the simplest way to draw angles. Because of their accuracy, many professions have relied on them before the introduction of CAD or computer assisted design. For example, surveyors used them for accurate calculations of the geography. Civil engineers have used them in designing bridges to make precise angle calculations to ensure it will support the weight load. In addition, architects have used protractors in to make designs free of flaws. That simple tool, the protractor, has served many people well. 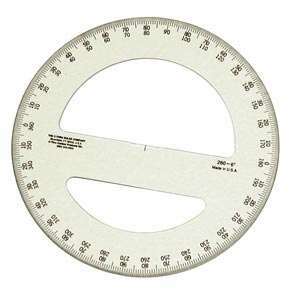 Although still used today to teach math and geometry, the trusty protractor has given way to the computer to perform its many functions.